The Celtic Ogham alphabet has long been shrouded in mystery, but many Pagans use these ancient symbols as tools of divination, although there's no real documentation of how the symbols were used originally. 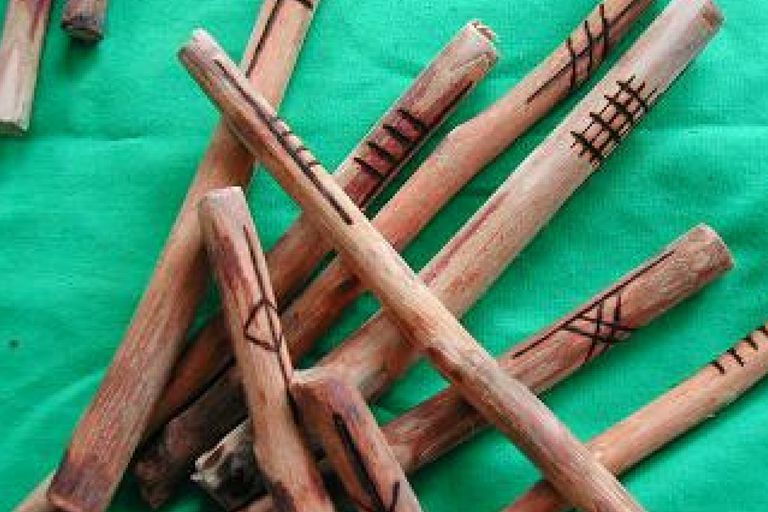 You can make your own Ogham divination set by drawing the symbols on cards or notching them into straight sticks. Beith, or Beth, corresponds to the letter B in the alphabet, and is associated with the Birch tree. When this symbol is used, it is representative of new beginnings, change, release, and rebirth. In some traditions, it also has connections with purification. Birch trees are hardy. They'll grow just about anywhere, including on bare soil. Because they tend to grow in clusters, what may be just one or two seedlings now can be practically an entire forest in a few decades. In addition to being a sturdy sort of tree, the Birch is useful. In days gone by, it was used for infants' cradles, and is still harvested today to make cabinets and furniture. From a magical perspective, there are a number of uses for Birch. The branches are traditionally incorporated into the construction of a besom, and are used for the bristles. Use the white outer bark in ritual in place of paper or parchment–just be sure you only harvest the bark from a fallen Birch tree, not a living one. Ancient herbalists discovered that various parts of this tree can be used for medicinal purposes. Bark was once brewed into a tea to fight fevers, and the leaves were used alternately as a laxative and a diuretic, depending on how they were prepared. Mundane Aspects: When this symbol appears, it means it's time to get rid of all those negative influences you've been carrying around with you. Figure out what things are bad in your life, which relationships are toxic, and find a way to leave them behind. Instead of being dragged down by the negative, focus on the positive things you have in your life, the blessings and abundance. Use these things as a focus, rather than the harmful or damaging ones. Magical Aspects: Consider the property of renewal and rebirth, as demonstrated by the Birch. Use this as a tool for spiritual and emotional regrowth, and developing your own ability to regenerate where there has been emptiness or devastation. Luis corresponds to the letter L in the alphabet, and is associated with the Rowan tree. This symbol represents insight, protection and blessings. The Rowan tree has often been associated with protection against enchantment and magic. Rowan sticks were often used to carve protective charms on, and hung over a door to prevent evil spirits from entering. The berries, when split in half, reveal a small pentagram inside. The Rowan indicates protection, as well as knowledge and insight about what is taking place in your surroundings. Mundane Aspects: Keep your awareness high, and go with your intuition when it comes to the people and events in your life. Trust your judgment, and don't allow yourself to be lulled into a false sense of security. Magical Aspects: Keep yourself true to your spirituality, staying grounded even in times of doubt. This will help protect you from that which might bring you emotional, physical or spiritual harm. F is for Fearn or Fern, which is associated with the Alder tree. The Alder is representative of the evolving spirit. Connected with the month of March and the spring equinox, Alder is the symbol of Bran in Celtic mythology. In The Mabinogion, Bran laid himself across a river as a bridge so that others might cross–likewise, the Alder bridges that magical space between earth and the heavens. It is also associated with oracular powers–Bran's head was an oracle in legend. Mundane Aspects: Keep in mind that you are an individual... but so is everyone else. When you look at someone, see the unusual which makes them themselves–and allow them to see that uniqueness in you. Be a mediator, a bridge, between people who may be having a disagreement. Magical Aspects: Follow your instinct. Others will turn to you for advice and counsel during spiritual disagreements, and it's your job to be the mediator and voice of reason. Mundane Aspects: One cannot evolve without changing. Realize that part of life's journey includes learning lessons–even unpleasant ones. This is a natural part of the human experience. Magical Aspects: Give yourself a break periodically, and take time to rest spiritually. Know that change will come when you are ready for it. Allow yourself some flexibility in your spiritual life as well. N is for Nion, sometimes called Nuin, which is connected to the Ash tree. Ash is one of three trees which were sacred to the Druids (Ash, Oak and Thorn), and connects the inner self to the outer worlds. This is a symbol of connections and creativity, and transitions between the worlds. In Norse legend, Yggdrasil, the World Tree, is an Ash. Its roots grew down far into the Underworld, and its branches reached all the way up into the heavens. Odin hung himself from the tree for nine days as a sacrifice. Ash also features prominently in the Irish myth cycles, and is often depicted growing beside a well or pool of wisdom. Mundane Aspects: Remember that for every action, there is a consequence, and these effect not only ourselves but others as well. What we do in our life will carry into the future and possibly even beyond. Every one of our words and deeds has some sort of impact. Magical Aspects: The Universe is like a giant web. Strands bind us all together, either closely or at a distance. We are all connected in one way or another, so it is important to find harmony between the spiritual realm and the physical, and between all living beings. Endeavor to live a spiritual life that considers the needs of the natural world around you. H is for Huath, or Uatha, and is symbolic of the Hawthorn tree. This prickly-thorned tree is associated with cleansing, protection and defense. Tie a thorn with a red ribbon and use it as a protective amulet in your home, or place a bundle of thorns under a baby's crib to keep bad energy away. Because the Hawthorn typically blooms around Beltane, it is also strongly connected with fertility, masculine energy, and fire. In folklore, the Hawthorn is associated with the land of the Fae. Thomas the Rhymer met the Faerie Queen under a Hawthorn tree and ended up in the Faerie realm for seven years. Despite its connection with female and goddess-centered pre-Christian belief, it's considered unlucky to bring Hawthorn into your home. This may stem from the fact that some species of Hawthorn give off a particularly unpleasant –almost corpse-like–scent after they've been cut. No one wants their home to smell like death. In Glastonbury, England, there's a famous Hawthorn tree known as the Holy Thorn. The tree that stands there today is supposed to be a descendant of one that stood on Glastonbury Tor two thousand years ago, when Joseph of Arimathea brought the Grail to England from the Holy Land. When Joseph thrust his staff into the ground, it turned into a Hawthorn tree. Mundane Aspects: If you're hoping to conceive a child, the appearance of Huath could be fortuitous. In addition to fertility, consider this a sign of protection, healthfulness and self-defense. Magical Aspects: Understand that no matter how thorny a problem may be, you can use your spiritual strength to protect and guide you. You may also find that you can provide strength to those who depend on you. D is for Duir, the Celtic tree of Oak. Like the mighty tree it represents, Duir is associated with strength, resilience and self-confidence. The Oak is strong and powerful, often dominating over its shorter neighbors. The Oak King rules over the summer months, and this tree was sacred to the Druids. Some scholars say the word Duir translates to "door," the root word of "Druid". The Oak is connected with spells for protection and strength, fertility, money and success, and good fortune. In many pre-Christian societies, the Oak was often associated with the leaders of the gods–Zeus, Thor, Jupiter, and so forth. The strength and masculinity of the Oak was honored through the worship of these gods. During the Tudor and Elizabethan eras, Oak was valued for its stength and durability, and was commonly used in construction of homes. The bark became valuable in the tanning industry, and many areas of Scotland were deforested in the rush to harvest Oak. Mundane Aspects: Carry an acorn in your pocket when you go to an interview or business meeting; it will be bring you good luck. If you catch a falling Oak leaf before it hits the ground, you'll stay healthy the following year. Remember that "Duir" means gate or door–watch for chances that may pop up unexpectedly, and take what is offered to you. After all, an unknown opportunity is better than a missed one. Magical Aspects: Be strong and steady like the Oak, no matter how unpredictable things may become for you spiritually. Your strength will help you prevail. T stands for Tinne, or Teine, the Holly tree. This evergreen plant is connected to immortality, unity, courage, and the stability of hearth and home. Pronounced chihnn-uh by the Celts, the wood of the Holly was often used in the construction of weapons, and is known as a plant of warriors and protectors. In the pre-Christian British Isles, the Holly was often associated with protection–planting a hedge around your home would keep malevolent spirits out, thanks in no small part to the sharp spikes on the leaves. In Celtic myth, the concept of the Holly King and the Oak King symbolizes the changing of the seasons, and the transition of the earth from the growing time to the dying season. When Christianity moved into the Celtic lands, the new religion associated the Holly plant with the story of Jesus. The poky spikes on the leaves represent the crown of thorns worn by Jesus on the cross, and the bright red berries symbolize his blood. Mundane Aspects: Hang a sprig of Holly in your home to protect your family in your absence. Soak the leaves in spring water under a full moon, and then use the water as a blessing for people or items you wish to protect. There is strength to be found in standing together, and ultimately protection comes from honor and trust. Magical Aspects: Develop the ability to respond quickly and wisely to your intuition. Learn to overcome and adapt to new situations, and to respond immediately to changes in your spiritual environment. Trust your instinct, but don't let your heart rule over your head. C, sometimes read as K, is Coll, which is the Hazel tree. August is known as the Hazel Moon, because this is when Hazel nuts appear on the trees–the world Coll translates to "the life force inside you", and what better symbol of life than the nut itself? Hazel is associated with wisdom and creativity and knowledge. Sometimes it is connected in Celtic lore with magical springs, sacred wells, and divination. Hazel was a handy tree to have around. It was used by many English pilgrims to make staffs for use upon the road–not only was it a sturdy walking stick, it also provided a modicum of self-defense for weary travelers. Certainly, it could have been used as well for ritual. Hazel was used in weaving of baskets by medieval folk, and the leaves were fed to cattle because it was believed this would increase the cow's supply of milk. In the Irish myth cycles, there is a tale that nine hazel nuts dropped into a sacred pool. A salmon came along in the pool and gobbled up the nuts, which then imbued him with wisdom. A variation of the story appears in the legend of Finn Mac Cumhail, who ate the salmon and then took on the knowledge and wisdom of the fish. Note that Mac Cumhail is often translated as Mac Coll. Mundane Aspects: Take advantage of your own artistry or creativity, and share your knowledge with others so they too can practice these arts. Lead by example, and teach those who wish to learn. Find inspiration for your creative gifts, whatever your talent may be. Magical Aspects: Let the divine guide you in your creative journey. Speak to the gods through your art, and be rewarded with inspiration. If you're stuck in a creative rut, call upon the Divine to send you a Muse. Q is for Quert, sometime spelled Ceirt, and is tied to the luscious Apple tree. Long symbolic of love and faithfulness, as well as rebirth, the Apple is often associated with magic. If you cut an apple in half sideways, the seeds form one of nature's perfect stars. In addition to love, the appearance of Quert reminds us of the eternal cycle of life. After all, once the Apple tree dies, its fruit returns to the ground to birth new trees for coming harvests. The Apple and its blossoms feature prominently in folklore related to love, prosperity and fertility. The Roman goddess Pomona watched over orchards, and was associated not so much with the harvest, but with the flourishing of the crop. Apples are also connected with divination, particularly for young ladies wondering about their love lives. Mundane Aspects: No one likes to be faced with choices, because sometimes what we want is not what we need. However, we still must choose. Sometimes, we make decisions because they are the right ones to make, not because they make us happy. Be wise enough to understand the difference. Magical Aspects: Open your inner soul to new decisions, and allow yourself to harvest the gifts that your spiritual path has to offer. Know that sometimes, things might not make sense, but chances are good that you'll learn from this later. M is Muin, the Vine, that magnificent plant which produces grapes... the source of wine. We all know that once we're under its influence, wine sometimes makes us say things we otherwise would never consider. In fact, the words of one who has been consuming it are often uninhibited. The Vine is connected to prophecy and truthful speaking–because typically, people who have been partaking of its gifts are incapable of being deceptive and dishonest. Muin is a symbol of inward journeys and life lessons learned. Mundane Aspects: Take time to think about what you say before you open your mouth, but once you open it to speak, only speak the truth. It is better to be honest than to tell people what they want to hear just to gain popularity. Magical Aspects: Do rituals related to prophecy and divination. Be sure to record all messages that you receive–they may not make sense right now, but they will later on. When you're sampling its pleasures, don't allow Vine to take too much advantage of you or it may color your perceptions of what is Truth. G is Gort, the Ivy that sometimes grows freely, but often parasites upon other plants. It will grow in nearly any condition, and its endless upward spiral is representative of our soul's search for self, as we wander between this world and the next. Gort, pronounced go-ert, is connected to growth and wildness, as well as confronting the mystical aspects of our own development and evolution. Also connected to the month of October and the Samhain sabbat, Ivy often lives on after its host plant has died–a reminder to us that life goes on, in the endless cycle of life, death and rebirth. In folklore from the British Isles, Ivy is believed to be a bringer of good fortune, particularly to women. Allowing it to creep up the walls of your home would protect inhabitants from baneful magic and curses. It also appears in love divination in parts of England; it was said that a girl carrying Ivy in her pockets would soon see the young man who was meant to be her husband. Medicinally, an Ivy tonic could be brewed to keep away diseases such as whooping cough and respiratory ailments It was even believed to keep away the plague, but there's no clear evidence that this worked. Mundane Aspects: Banish the negative things from your life, and eliminate toxic relationships. Place a barricade of some sort between you and the things or people that would bring you down. Magical Aspects: Look inward to find self-growth, but turn outward to find spiritual companionship with like-minded individuals. If you've thought about joining or forming a group of some sort, consider it well if Gort appears. Mundane Aspects: When this symbol appears, it's time to take on a leadership role. Often, it indicates a need to rebuild that which was destroyed. Use your skills and ability to put things in order, and guide situations onto the right track. Think before you act, and be proactive rather than reactive. Magical Aspects: Although you may encounter some bumpy spots in the road, ultimately your spiritual journey will be a fruitful and productive one. Understand that the lessons you learn on your way are equally as important–maybe even more so–as the destination itself. This symbol, used for the sound St, is Straith (sometimes seen as Straif), the Blackthorn tree. A symbol of authority and control, the Blackthorn is connected to strength and triumph over adversity. Blackthorn is a tree (although some might argue it's more of a really big shrub) of winter, and its berries only ripen after the first frost. White flowers appear in the spring, and the bark is black and thorny. On a medicinal level, Blackthorn berries–sloe berries–are brewed to make a tonic (this is what Sloe Gin is made from). The tonic can be used as a laxative and/or diuretic, as well as a skin astringent. In folklore, the Blackthorn has a fairly unpleasant reputation. An English legend refers to a devastating winter as a "Blackthorn Winter." It also represents the darker side of magic and witchcraft. Because it's a plant that becomes hardy when all around it is dying, it is associated with the Dark Mother, the Crone aspect of the Goddess, particularly the Cailleach in some parts of Scotland and Ireland. There is also a strong connection to the Morrighan, because of Blackthorn's association with the blood and death of warriors. In fact, in early Celtic culture, the Blackthorn was popular for its use in the cudgel shillelagh. Mundane Aspects: Expect the unexpected, especially when it comes to change. Your plans may be altered, or even destroyed, so plan to deal with it. The appearance of Straith often indicates the influence of external forces. Magical Aspects: You're at the beginning of a new journey, and there will be some surprises–possibly unpleasant ones–along the way. Overcoming these obstacles will give you strength. Realize that you–and your life–are changing. R is Ruis, the Elder tree, which is connected to the time of the Winter Solstice. The Elder represents endings, maturity, and the awareness that comes with experience. Pronounced roo-esh, Ruis is a sign that things may be ending, but will yet begin again some day. Although the Elder is easily damaged, it recovers and is rejuvenated easily. The Elder is also strongly connected with Goddess spirituality, and the workings of the Fae. The soft wood has a lightweight core that can be pushed out to create a hollow tube–perfect for a Faerie flute! Elder was also planted near dairy barns, in the belief that its presence would keep the cows in milk, and prevent collected milk from spoiling. Elder flowers and berries are often brewed to fight fever, cough, and sore throats. Mundane Aspects: This is a time of transition; while one phase of life ends, another begins. With maturity and experience comes wisdom and knowledge. Remember that it's fine to be childlike, but not childish. Magical Aspects: New experiences and new phases of growth are continual, and these will all lead to spiritual renewal, and finally rebirth. Remember that the things we experience are all part of the formation of who we eventually become. A is for Ailim, or Ailm, the Elm tree. Interestingly, this group also includes the Pine or Fir trees. These giants of the forest are symbols of perspective and height, rising above those that surround us. The Elm has a clear vision of that which surrounds it, as well as that which is approaching. In Britain and Scotland, Elm trees grew very tall and straight, making them popular for use as a Maypole during Beltane celebrations. In addition to this, they were popular as property markers–you knew you had reached someone else's land boundary when you crossed a line of Elm trees. Elm is flexible and bendy, so it doesn't make a very good building material, but it does withstand water very well, so it eventually became popular for use in making flatboats and wheels. In Wales, early bowmen used the Elm in construction of longbows. Mundane Aspects: When this symbol appears, it means it's time to start looking at the big picture; see the trees, but also acknowledge the forest. Be aware that your perception includes long-term goals and ideas, and prepare for what may be coming along the path. Magical Aspects: Mark your progress well as you grow and develop spiritually. As you attain new levels of wisdom, look at the future and see where this new knowledge will take you. Also recognize that there will be others following in your footsteps, so make yourself available to guide them and give them a hand when they need it. O is Onn, or Ohn, and represents the Gorse bush, sometimes called Furze. This yellow, flowery shrub grows on moors all year long, and is full of nectar and pollen. It's a food source for many animals–the stalks are munched on by grazing livestock–but eventually Furze is set on fire. This controlled burn allows old deadwood to be gotten rid of, and clears the way for new life to begin. Gorse (Furze) represents long-term thinking and planning–knowing that sometimes we have to do without in order to gain things in the future. Gorse is a determined sort of plant that always comes back, and so it is also connected with perseverance and hope. In some pieces of Celtic folklore, the Gorse is used as a protective barrier. Planting it around one's home would keep the Sidhe away, and it can be shaped into a broom for sweeping away negative influences. Mundane Aspects: Whatever you've been looking for is right around the corner–keep pursuing your goals, because they are within your reach. If you aren't sure what path you should be on or which direction you should head, sit down and make a list of goals. Figure out the destination, and then you'll be able to focus on the journey. Magical Aspects: Your spiritual journey has provided you with an abundance of gifts. Don't keep these blessings to yourself–share them with others! If you've been asked to take on a role as leader or mentor, now is the time to do so. U (sometimes W) is Uhr or Ura, the Heather plant, which symbolizes passion and generosity. This ground-covering plant grows on top of peat in the moors of the Celtic lands. The blossoms are full of rich nectar and are very attractive to bees, which are seen in some traditions as messengers to and from the spirit world. Uhr is associated with both generosity and healing, as well as contact with the Otherworld. Historically, the Picts used the flowers of the Heather plant to make a fermented ale–the natural sweetness of the plant probably made this delicious! It is also known to bring good fortune, particularly the white variety of Heather. A number of Scottish clansmen tucked Heather in their bonnets before going into battle. From a practical standpoint, Heather was also harvested to use for thatching. Dyes and brooms were made from it as well; if you make a besom of your own, use some Heather for the bristles. Medicinally, Heather has been used to treat everything from consumption to "agitated nerves." The great Scottish poet Robert Burns advocated its use in "Moorland Tea," brewed from the harvested flowers. Mundane Aspects: When this symbol appears, it means it's time to de-stress. Look inside yourself for healing if your body needs it, and don't delay. Listen to what your physical self is telling you. Remember how closely our physical well-being and emotional health are tied together. Magical Aspects: Blend the energy of the spirit with the healing of the body. Focus on whole healing–body, mind and spirit–to build a healthy soul. Meditate on this symbol to increase your spiritual awareness. If you're feeling a bit fragmented, mentally, burn some Heather to help you gather your thoughts back together. E is Eadhadh, or Eadha, which is the Aspen, a symbol of endurance and courage. The Aspen is a durable, hardy tree that grows all over North America and Scotland, so when Eadhadh appears, take it as a sign of strong will and success. Challenges may come your way, but you will eventually conquer your adversaries and obstacles. In folklore and literature, the Aspen is associated with heroes, and many "crowns of Aspen" have been found in ancient burial sites. The sturdy wood was popular for making shields, and were often imbued with magical protective properties. In the Highlands of Scotland, the Aspen was often rumored to be connected to the realm of the Fae. Mundane Aspects: Like the Aspen, you can be flexible without snapping. No matter what obstacles come, allow yourself to know that these too will be gone eventually. You will be left stronger for the experience, if you can get over your fears and reservations. Magical Aspects: Don't give in to the pressures of the material world. Focus instead on your spiritual journey, even if it seems like it would be a lot easier to give up and let things fall by the wayside. Even in the Tarot, the Fool knows he has a long way to go, but the first step is the hardest. When Eadhadh appears, put aside your distractions, and take that first all-important step on your journey. I is Iodhadh, or Idad, the Yew tree. Much like the Death card in the Tarot, the Yew is known as a marker of death and endings. This evergreen tree has leaves that are attached in a spiral pattern to the twigs. Because of its unusual growth pattern, in which new growth forms inside the old, the Yew is strongly tied to rebirth and new life following death. The Yew has no medicinal value at all, and in fact, it's mostly toxic. Livestock have been known to die from eating the poisonous leaves. Berries can be used, but should be treated with caution. On a practical level, the wood of the Yew tree is very hard and resistant to water damage, so it was popular in the making of longbows in England. "No tree is more associated with the history and legends of Great Britain than the Yew. Before Christianity was introduced it was a sacred tree favoured by the Druids, who built their temples near these trees–a custom followed by the early Christians. The association of the tree with places of worship still prevails." Mundane Aspects: Although it may not represent spiritual death, if Iodhadh appears, it's a sign that major transitions are coming. Be aware of them, and realize that although not all of them are bad, they will probably be pretty significant. Now's a good time to get rid of things which are of no use to you, in order to make room for new beginnings. Magical Aspects: Changes are on the way, so quit clinging to beliefs and ideas that no longer serve you well. Shed the old, and welcome the new. Accept change for what it is–an asset–and stop seeing it as an obstacle. Don't fear new things, embrace them. The Eabhadh symbol, which represents the sound Ea, is connected to trees which are found in groves–Aspen, Birch, etc.–the sacred places where Druids once gathered. When Eabhadh appears, it's often a clue that there is some sort of conflict resolution, justice, or counsel about to occur. In some traditions, this symbol is associated with attracting the harmonies of life through spiritual growth. The very concept of a grove brings to mind a spiritual place. Many members of modern-day Druidic traditions refer to their group as a grove rather than a coven or other word. It brings to mind a place where people can gather to work out their differences, if everyone involved is so willing. Mundane Aspects: Treaties can be made, misunderstandings cleared up, and differences resolved... as long as all affected parties are willing to both listen AND speak. If this symbol appears, understand that at its core lies communication. No war can end without discussion, no compromise reached without listening to the needs of others. Magical Aspects: Learn to lead by your examples and actions–in other words, practice that which you preach! Try not to be judgmental, unless you are asked for guidance or to give counsel. If that does happen, be sure you use fairness and wisdom, rather than emotions, to resolve the situation. Be just and ethical, rather than trying to be popular. Oi, sometimes representing the Th sound, is Oir, the Spindle tree, which was used to make bobbins and pegs, as well as (obviously) spindles. This dainty little tree is misleading–while it looks delicate, it's also very strong. The durability and strength of the wood made it useful for oxen-goads, which were used in ploughing. The white flowers and bright red autumn fruits, connect the Spindle tree to the hearth and home, as well as the bonds of kinfolk and clan. Mundane Aspects: When this symbol appears, focus on family honor. Remember that in addition to blood family members, we have people that we choose to invite into our hearts, our spiritual family members. Fulfill obligations you may have to people you love, whether you have been planning for or not. Don't be afraid to ask questions, but ultimately, do what's right for those who enjoy the hospitality of your hearth. Magical Aspects: Work on developing a connection not only to the people in your clan, but in the greater spiritual community. Remember that differing tribes still have to work together for a common purpose, and that means someone has to assume the role of mediator when conflicts arise. If you're active in the Pagan community, or in a specific group, this may fall to you. Ui (sometimes interpreted as Pe) is Uillean, the Honeysuckle. Associated with the manifestation of will, the Honeysuckle starts as a small seed and creeps along, growing and spreading over time. Honeysuckle twists and spirals up and over its surroundings, its soft yellow flowers releasing a sweet scent. It is the flower of unspoken desire, hidden needs, secret wants, but it also represents our goals of finding our true Self. "the ripe seed gathered and dried in theshadow and drunk for four days together, doth waste and consume away the hardness of the spleen and removeth wearisomeness, helpeth the shortness and difficulty of breathing, cureth the hicket (hiccough), etc. A syrup made of the flowers is good to be drunk against diseases of the lungs and spleen." Mundane Aspects: When this symbol appears, it means you need to allow yourself the freedom to pursue your desire. If you've got hopes or dreams that are unattained, now is your time to start considering whether they're remain just dreams, or become reality. Denying yourself the chance to enjoy life is unfair. Magical Aspects: Take the time to experience joy, but make sure you stay true to your values and beliefs as well. In many Wiccan traditions, the Charge of the Goddess is quoted as a reminder of this: All acts of love and pleasure are my rituals. Another aspect of this symbol is that sometimes, mysteries which seem to be hidden may not be as hard to delve into as you think–sometimes, you've just been sidetracked by distractions. Io (sometimes Ph) is Ifin or Iphin, the Pine tree. This evergreen was once known as the "sweetest of wood," and its needles can be brewed into tea which provides a good source of Vitamin C. Pine is associated with clarity of vision, and alleviation of guilt. When Ifin appears, it may indicate feelings of guilt that need to be put aside, or unresolved conflicts that need closure. In Scotland, the Pine was a symbol of the warrior, and in some stories it was planted over the graves of those fallen in battle. More often than not, the Pine was used as a building material, and it continues to be used as such today. Mundane Aspects: When this symbol appears, it means you need to stop beating yourself up over feelings of guilt. Did you say something hurtful, and damage a relationship? Now's the time to mend it. Make amends for mistreating others, whether it was deliberate or accidental. Magical Aspects: Use any residual bits of guilt to bring about change. To do this, you'll need to focus on the root cause of your feelings. Once you find the source of your discomfort or anxiety, channel that negative energy, turn it around, and use it as a tool of transformation. When this symbol appears, it may also be a hint that you're not seeing things as clearly as you should be. Put aside emotions and look at things from an intellectual standpoint–in other words, don't let the heart rule over the brain. Ae (sometimes represented as X or Xi), is Amhancholl or Eamhancholl, associated with Witch Hazel. This natural astringent is purifying and cleansing. The word Eamhancholl literally translates to "twin of Hazel", so there is a strong connection to C–Coll in the Ogham. When Amhancholl appears, it's usually an indicator that cleansing and purification is necessary or has taken place. From a purely medicinal standpoint, Witch Hazel has long been used as a cleanser and astringent. Native American tribes turned it into a poultice which was used to treat swelling and tumors. Amongst the early settlers, midwives arriving in the New World found that it could be used to prevent sepsis following childbirth or an abortion. Today, it's still in use as a treatment for skin inflammations, such as insect bites, mild burns, and even hemorrhoids. Mundane Aspects: When this symbol appears, it means it's time for a cleansing. Sometimes this is a physical cleansing of our Self, but often it applies to emotional clutter and baggage. Smudge your home, get rid of all the negative energies around you, and allow yourself to purify both your body and your mind. Magical Aspects: This is a good indicator that you need to do a re-evaluation of your spiritual life. Are you studying things that no longer interest you? Are you hanging on to books or other magical items that you know you'll never need–or worse, that you really dislike? If you're feeling stagnant, or that you're drifting a bit on a spiritual level, when this symbol appears it probably means you need to rethink your priorities. What are your spiritual goals? Do a cleansing ritual, and help yourself begin anew.